A roof replacement will benefit you for the long-term, protecting your home for years to come and raising your home’s value. When you choose a responsible roofing company, they’ll do almost all of the work, from prepping your old roof for removal to cleaning up after the job is done. However, there are a few things you can do to make your roof replacement go even more smoothly. Minor things like cutting the grass, taking down your mirrors and bringing the children to Grandma’s house can make a big difference. Find out exactly what you should expect for the big day. We’ll walk you through preparing for a roof replacement in four steps: preparing your yard, preparing your home, preparing your children or pets and what to do after your roof replacement is finished. Roofers will be walking in your yard while they work. Plus, old shingles, nails and other debris will fall off the roof as the roofing team removes your old roof. They’ll park a dumpster in your driveway, and work from the opposite corner of the roof towards the dumpster. That way, they get as much of it as possible in the dumpster. Clear your vehicles from the driveway and garage: The night before your roofing team arrives, park your cars a safe distance away on the street. If you wait until the morning, your car might get trapped as a supplier tries to drop off shingles or other materials. Plus, the roofers will need to use your driveway all day. They will park their garbage bin in the driveway and bring their equipment nearby so they can place it on the roof when they need it.You might be tempted to put your vehicle in the garage if you won’t be using it and aren’t worried about it getting trapped there for the replacement. However, this is a bad idea. Garage roofs are usually not insulated, so shingle granules and nails will drop through the roof as the roofers work. The granules will then gather on your car and will scratch the paint as you wipe them away. The safest place for your vehicle is the street. Clear toys and patio furniture: Roofing professionals will need to walk all of the way around your home to access the roof from different sides. You don’t want them tripping on children’s toys or wasting time moving your furniture. Ensure there is a 15-foot clearance all of the way around your house. Falling shingles and debris might damage your outdoor toys and furniture. It’s best to put what you can move into storage in the shed or garage, and cover it with a tarp. If you have a gazebo that you can’t move, take down or tie up its curtains. Clear the garden: Take a peek into the garden and move what you can. This might include solar-powered lights, statues, mosaic stepping stones, potted plants, water fountains, wind chimes, bird houses, and bird feeders. A dropped shingle could damage all of these delicate items. Plus, you don’t want the local birds trying shingle granules for lunch! Mark or protect plants: Certain plants can be very delicate or very expensive to replace. Plants are vulnerable to dropped shingles. 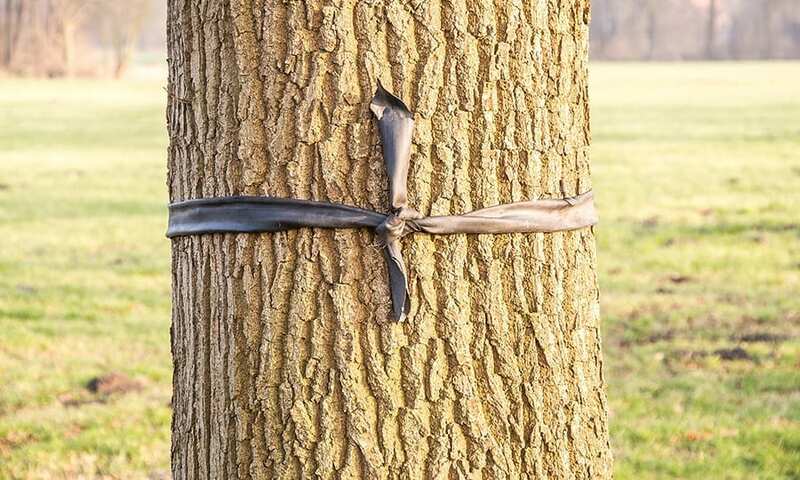 Mark out any especially valuable or fragile trees or plants with orange tape. Place netting or a tarp over flower beds and other plants. If you show the roofers’ manager which plants need extra care, he or she will ensure the other roofers give them an extra wide berth. Mark sprinklers: If you have a sprinkler system that you can’t remove, then you should mark each sprinkler head so that the roofers will not trip over it. You should mark essentially anything embedded in the ground that roofers could trip over. Mark ponds: Homeowners with green thumbs often have hidden water features, such as small natural pools tucked behind reeds or koi ponds covered in foliage. Notify your roofing professionals of your pond and mark it, so that no one accidentally steps into it. Unlock your gates: Your roofing professionals will need to get all of the way around the house in order to do their job properly, so you’ll need to unlock the gates for them. Cut your grass: It’s much easier to find leftover debris and nails in short grass. Cutting your grass will help the roofers find any hidden nails and can save you the misfortune of stepping on one. Check your electrical outlet: Your roofing professionals might need to use powered equipment on your roof, so they’ll need access to an outdoor electrical outlet. If you have one, make sure it works. If you don’t, plan to leave a door or window open near an outlet that the roofing professional can use. Talk to your neighbors: While you’re outside preparing, take the time to talk to your neighbors, especially your direct neighbors, about your roof replacement. 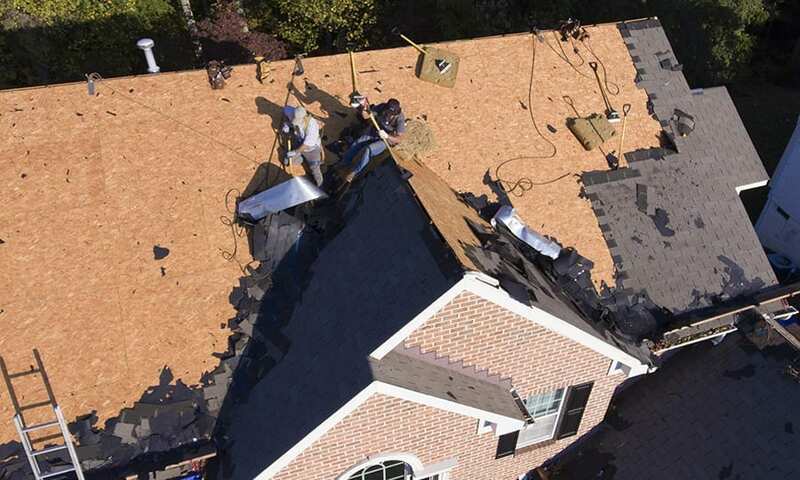 If you warn them ahead of time about the noise, disturbance and the possibility of a shingle or nail flying into their yard, they will be a lot more co-operative the day of your roof replacement. Also, ask them if they would unlock their gates for the roofing team. If they do, then a roofer can grab any stray shingles they spot in the neighbor’s yard. Further, if their property is very close, they may also want to cover their plants, and the roofers may need to board up their windows. If you happen to share a driveway, your neighbor will need to park their car on the street too. Clear the attic: We often put sentimental and fragile items in the attic, but that makes them very vulnerable during a roof replacement. Store them on the ground floor for now. Protect the attic: The attic is going to collect the most dust during your roofing replacement. It is wise to lay tarps or painter’s drop sheets on the floor to make clean-up easier. Protect the garage: If your garage is built-in to the house and roofers will be replacing its roof too, everything in it needs extra protection. Often garages don’t have insulation, which normally would stop dust and shingle granules from dropping through the roof. Those granules have the potential to scratch paint. So, you should cover any precious items you have in the garage with a tarp. This might include car or motorcycle parts, collectibles, tools, etc. Secure your windows: Falling roof material can scratch windows. You roofers should place wooden boards over the windows to protect them until the original roof has been completely torn off. Remove wall décor: The vibrations from hammering can knock decorations off walls, so you should take them down ahead of time. This might include mirrors, pictures, wreaths, loose shelving, etc. Be extra thorough on the top floor because it will move more. Protect fragile items: These same vibrations can potentially hurt your especially fragile items, such as china plates. 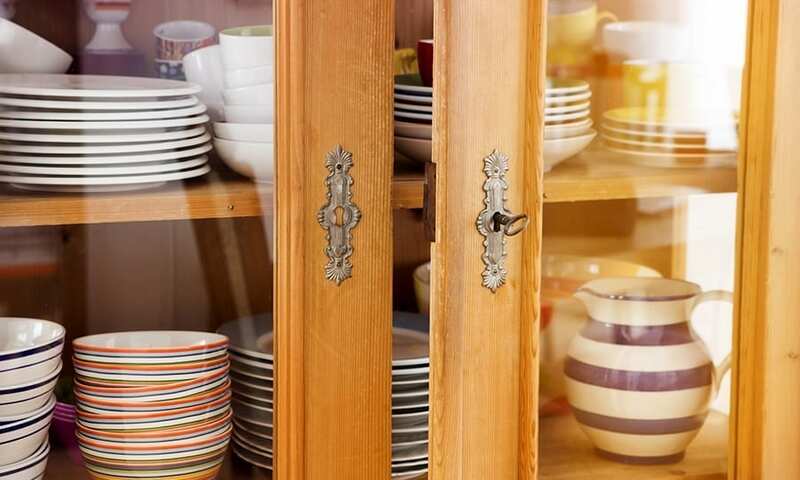 Make sure glass, vases, dishes, and other breakables aren’t touching each other or the wall. A roofer will remove your roof accessories: Anything that you have on the roof, including satellite/TV dishes, skylights, and solar panels, will be removed from the roof and reinstalled. Expect television interruptions. Keep pets indoors (at least): Hammering and strangers disturb dogs, cats, even hamsters. It’s better to have your pet at a friend’s house or a kennel service while you have a roof replacement. If that’s not an option, at least keep your pets indoors. Otherwise, they may step on a stray nail. Prepare to comfort pets: If your pets have to be indoors, do what you can to make them more comfortable. Take them for a walk beforehand and make sure they have access to their crate and comforting toys. Have the children stay at Grandma’s: Infants won’t be able to sleep, young children will get frustrated, and older children will be distracted. It might be best if you can arrange for your children to be at a family member’s or friend’s house. If you’re leaving with them, be sure to leave your phone number with the roofers so that they can contact you if they need to. Tell children about the debris: If they are old enough to understand, tell your children that they’ll have to be careful around the house because there might be debris. Ensure they’re always wearing shoes too. Inspect the roof: Your roofing team should show you the new roof, to ensure you’re happy with their workmanship. After they’re gone, you should feel comfortable calling them up about anything unusual you find minutes later, or even during your regular inspections. Sometimes, additional work is needed to complete a roof renovation. It’s possible that changing weather conditions knocked a shingle loose before it could seal, or someone forgot to place that last ridge cap shingle. Honest mistakes happen, and professional roofers should be eager to fix them. Check the driveway: With all of the equipment that has been in and out of your driveway, there’s a chance someone scuffed your grass, marked your driveway or dripped some oil. If you notify the roofing professionals about the problem right away, they should be happy to make it right. Pay them: Don’t forget to fulfill your end of the bargain. If you like the contractor’s work, remember that they appreciate quick payment. Hopefully, you’ll gain more than a roof replacement; you’ll gain a relationship with a roofer you trust. You’ll find that this relationship will be valuable for as long as you own a home. If you’re still looking for a professional roofer to replace your roof, you can find one through IKO’s Contractor Locator. Otherwise, it may help you prepare for your roof replacement to learn more about your roof and how it is supposed to function. Check out IKO’s blog for more resources.